Manufacturer & Supplier of Plastic Tree Planters. Our product range also comprises of Railing Planter, FRP Planters and Stainless Steel Planters. We are a leading firm offering Plastic Tree Planters to our clients. Materials are used that are long lasting and increases the life of these planters as well. It has a perfect size that can be fitted for use in home, garden and nurseries. Also it ideal for flowering plants and growing herbs. It is made using finest grade materials and is used in conservatories or other temperature controlled plant filled areas. It has appealing looks that attracts our maximum clientele. 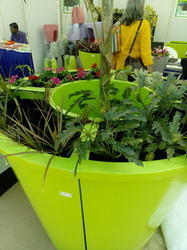 We are one of the top most firms offering Plastic Rotomolded Planters to our clients. This flexible product can be placed in outdoors, indoors, terraces, living room and lobby. We cater the demands of our clients and offer them to customize the product as per their specifications. The manufacturing is done using high quality materials that we source from our clients. These enhances the look of the area and give an elegant touch.